Enjoy this 4-hour escape from Denver or Boulder on a small-group guided tour. This scenic loop will give you a taste of the Rockies with some incredible views of the plains and the Mountain Range. You will visit the famous Red Rocks Amphitheater, pass some Western towns and view the iconic Flatirons rock formation in Boulder's backyard. Stop at Pearl St. for a local fresh brewed coffee. From Union Station, drive along a scenic highway through a rugged canyon as you make your way to Red Rocks Amphitheater, one of the best outdoor music venues on earth where music has echoed off the sandstone cliffs for decades. Spend some time walking around the incredible venue and enjoy the fantastic views of Denver. 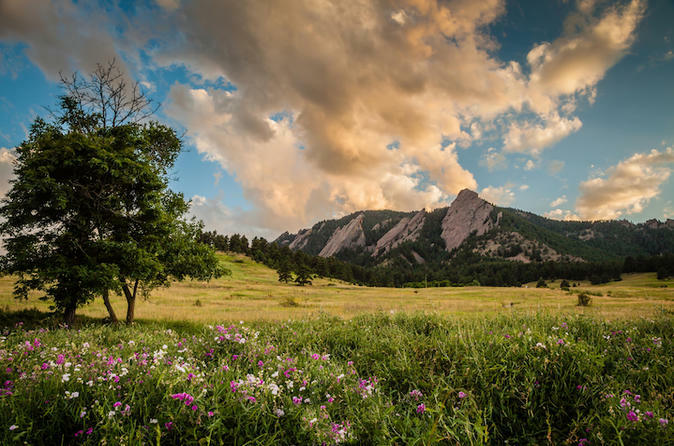 Next we'll continue through the flatirons and stop at the gorgeous Chautauqua park, located at the base of Boulder’s Flatirons and one of only 25 National Historic Landmarks in the state of Colorado. In fact, if you're planning a visit to Boulder many locals say " oh you have to go to Chautauqua!" With the Flatirons as a back drop, and trails all around, there will be plenty of peaceful picturesque moments. Next well stop at Boulder's Pearl St. Mall for a coffee at a local favorite spot (coffee's on us!). The Mall, a 4 mile pedestrian street, is known for its many shops, breweries and restaurants.